Today’s blog is Part 2 of How to Challenge the Eating Disorder Thoughts In Your Head. Living with an eating disorder is difficult because you constantly analyze your body and the food you are eating. You check your body in the mirror. You fear if you eat you will not be able to stop eating. You fear if you eat it means you are not disciplined or good enough. You fear your body changing. You feel so overwhelmed and like you cannot handle all that is expected of you. You have so much pressure to do well in school, at home, and at life, and all this pressure causes you to worry how you are going to get it all done. You feel out of control and powerless. The eating disorder voice in your head highlights all this pressure, expectations, and stress, and makes you feel like an awful, terrible person. This voice tells you that you are not good enough and not worthy. It makes you feel not capable to get it all done. This voice shames you for eating and it shames your body. The worse you feel, the more powerful this voice becomes. Last week I wrote about how to challenge the eating disorder voice in your head. You can read more about that here. Recognize these thoughts as lies and collect evidence of what is true. Separate yourself from the voice. Now that you have started to challenge the eating disorder voice it is time to start to silence it. Let me start by saying this is not easy. This is why therapy can greatly support you in your recovery from your eating disorder. 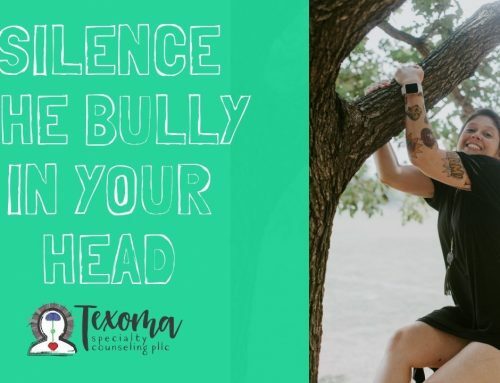 It is a real challenge to silence this voice and it takes a lot of effort, but having a therapist trained and specializing in eating disorders will help you learn to overcome this nagging and critical voice in your head. You can find a local eating disorder therapists near you here. What can I do about how I feel? How am I like my ideal self today? Honestly, your weight, body shape, and size, and how you eat has nothing to do with who you are. However the eating disorder voice in your head tells you the opposite. It is telling you that what you weigh and what you eat has everything to do with your worth. But when you die is this what people will remember about you? No, people will remember WHO you are and WHAT you did for them. This is what is true. Find a journal and write down what makes you a good person. What do people love about you? Why do people like spending time with you? How were you helpful today? This is the truth about you. This is what matters. Now let’s look at what you can do about how you feel. Your eating disorder has become the tool for how you cope with stress and upset. You are taking all your feelings out on your body. 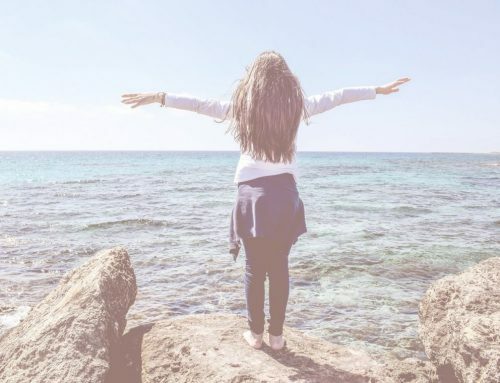 You have lots of ways to deal with stress and upset, it is just that the eating disorder voice is keeping you from recognizing the resources and tools you have to be OK.
We cannot always control bad stuff, because life is hard and bad stuff happens, but we can control our reaction and response to it. You can silence the eating disorder voice in your head by learning ways to deal with emotional upset. This question asks you to look at what things are important to you. I mean like way deep down what is important. How do you want to spend your time? Who do you want to be with and what do you want to be doing? What is most important to you? This question considers your morals and values. You are more than a body, you are a soul and you have beliefs, actions, and ideas that make your soul happy. These are the things that give you worth and it has nothing to do with your weight, your body size, and what you eat. Again this is beyond body goals. This is about what is makes you excited and what brings you joy. This question asks you to consider the type of person you want to be. Close your eyes. Imagine yourself 5 years from now. What are you doing? Who are you with? What is making you happy? This is your ideal self and is the person you are working to become. These things are what make you important and valuable. These are the goals and aspirations you are working so hard to achieve. 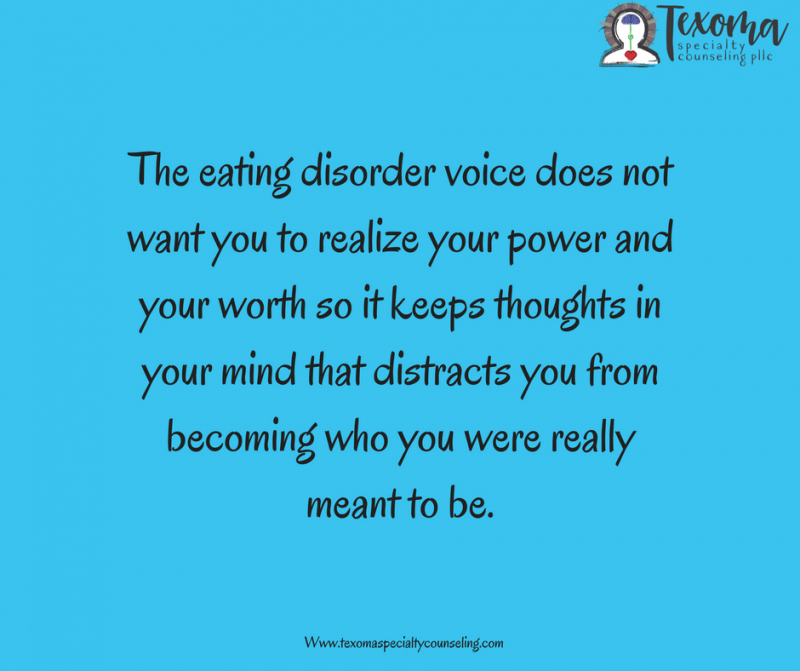 The eating disorder voice does not want you to realize your power and your worth so it keeps thoughts in your mind that distracts you from becoming who you were really meant to be. Your eating disorder voice does not support your ideal self and it is keeping you from being your true self. The voice is listing all the wrong things you did and how you screwed up. It is telling you that if you just restrict or if you just keep eating you will be better. The eating disorder voice keeps you from recognizing all the good you do and all the value you bring. But look at your ideal self and what is most important to who you want to be. Asking yourself this question forces you to look at what you did right and well. It asks you to evaluate the good and quality you bring. It forces you to evaluate your worth despite all the bad the voice is saying. As you start to learn to identify eating disorder thoughts and separate yourself from those thoughts, you will start to learn to challenge the thoughts as they appear. You will realize it is not true and that you offer value. You will be able to stop the voice in its tracks. When it says “You have no friend because…” You will be able to stop it because it isn’t’ true. Here is a great story from a women in recovery for an eating disorder. She talks about the voice and how you can learn to silence the voice in its tracks.